The deal-makers at Sime Darby Bhd are probably heaving a collective sigh of relief. On Tuesday, the Securities Commission (SC) lifted the veil on its much-awaited decision as to whether Sime Darby would have to make a mandatory general offer (MGO) for luxury property developer Eastern & Oriental Bhd (E&O). Ultimately, the regulator ruled that Sime Darby and E&O managing director Datuk Terry Tham Ka Hon were not parties acting in concert, and as such a MGO would not arise. The decision threw cold water on the month-and-a-half-long saga that gripped Corporate Malaysia and kept the investing public on tenterhooks. Tham is one of three parties selling a stake to Sime Darby. But this development marks the end to only one part of the SC's review still pending is the inspection of all stock transactions at E&O following its chairman Datuk Azizan Abd Rahman's purchase of 450,000 shares in the open market over five transactions from April to August this year. His last purchase of 100,000 shares was on Aug 12, just two weeks before Sime Darby announced it was buying 30% of E&O. This period also coincided with a drastic increase in the trading volume of E&O shares, according to Bloomberg data. Besides Azizan, another party that aggressively bought shares was E&O shareholder GK Goh Holdings Ltd. It purchased 1.25 million shares over three days, raising its stake to 11.6%. 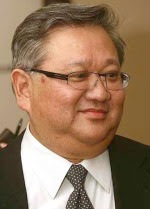 Azizan is SC chairman Tan Sri Zarinah Anwar's husband. In accordance with the SC's internal governance processes, this disqualified her from the review due to conflict of interest. The SC said the review was led by two of its most senior independent commissioners, Datuk Francis Tan and Datuk Gumuri Hussain. While some quarters have wondered aloud as to why the SC took as long as it did to reach a decision, an SC spokesperson reportedly said there was no specific time-frame for such reviews because there were various factors to be considered, including how soon the SC is able to access information related to the circumstances. If nothing else, this outcome puts an end to the uncertainties surrounding the fate of Sime Darby's acquisition, made during a volatile period that saw the share prices of both companies seesaw in different directions. For instance, Sime Darby shares hit a 13-month low of RM7.70 on Sept 19 on investors' fears that it might have to launch a MGO as well as the general market sell-down by foreign holders. Shortly after the deal came to light, E&O shares soared to RM1.76 on Sept 6, its highest in four years. However, the entire affair over E&O began even before Sime Darby stepped into the picture. In July, E&O was at the centre of rumours that SP Setia Bhd was keen to buy it, sending the former's stock up to RM1.70. SP Setia now a takeover target itself brushed off the gossip, but market talk persisted that E&O shareholders were looking to divest their stakes. Then, on Aug 28, a Sunday, Sime Darby told Bursa Malaysia of its plan to acquire 273 million shares and 60 million irredeemable convertible secured loan stocks, or a 30% interest, in E&O for some RM766mil. The stake was to be bought from three vendors Tham, Tan Sri Wan Azmi Wan Hamzah and Singapore-listed GK Goh. The deal took many by surprise, coming on the cusp of the Hari Raya and Merdeka Day holidays, a time when most would have either returned to their kampung or were on their way. Sime Darby's offer price was RM2.30 per E&O share, a staggering 60% premium to its then market price. But Sime Darby defended the deal, saying it was a 20% discount to E&O's estimated realisable net asset value of RM3.2bil, or RM2.88 per share. With the stake sale done, Sime Darby is now E&O's single largest shareholder. Bakke says the acquisition would enable Sime Darby to gain expertise in highend property offerings. Predictably, the prevailing question on most people's mind was this: Why such a high premium? And why only 30%, which neither cedes it full control nor notable profits? Sime Darby went into damage control mode after that, with its president and group chief executive Datuk Mohd Bakke Salleh doing the rounds with the press. He told StarBiz in an interview that the acquisition would enable it to gain expertise in high-end property offerings, the speciality of E&O. It is understood that Sime Darby, whose domain is in township development and mass housing, wanted a foothold into the top-end of the market, which commands higher margins. 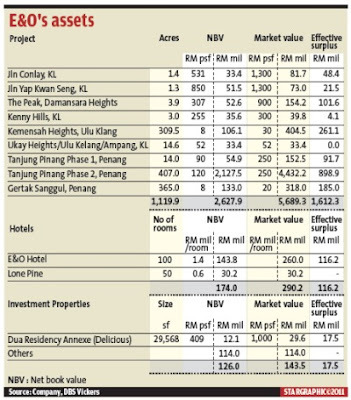 For E&O, pundits argued that the key selling point was its 980-acre Seri Tanjung Pinang seafront development in Penang, estimated to have a gross development value of RM10bil. E&O holds the concession to reclaim 740 acres for the second phase of the project in Tanjung Tokong to create two islands for mixed development. Seeing that E&O needs between RM3.2bil and RM3.5bil to kickstart the reclamation, it could do with the financial shot in the arm of a conglomerate like Sime Darby. But Sime Darby's stand has always been clear: it did not buy into E&O with the intent of a merger, but rather to enter as a stakeholder with the right size to get a feel of its operations. Bakke had told StarBiz that plans were already afoot to second some of Sime Darby Property's staff to E&O for exposure. “We will make a general offer if we think it is appropriate. Since it (E&O) is a listed company, we could not do a due diligence or a feasibility study (for the stake purchase),” Bakke said. This was not enough to placate minority shareholders, many of whom felt left out of the hefty 60% premium. Following intense pressure, the SC initiated a review to determine whether Sime Darby's actions had indeed necessitated a MGO. Although the threshold for control is 33%, Para 6.2 of Practice Note 9 of the Takeover Code 2010 states that the SC has the right to consider all surrounding circumstances to deem if control has been passed to a new party, thereby mandating the new party to launch a MGO. Among the criteria in Para 6.2 is “the consideration for the acquisition of the voting shares”, or the premium to market paid for the shares. Besides the issue of price, Sime Darby together with the three vendors from whom it purchased the stake would still collectively own about 41% of E&O post-transaction, arousing questions if they were persons acting in concert, an accusation they have vehemently denied. While all this was happening, another party quietly accumulated E&O shares in the open market. Controlled by renowned banker Tan Sri Azman Hashim, ECM Libra Financial Group Bhd upped its stake to 6.3% from 5.1% in April, then raised that to 6.5% on the day of E&O's AGM on Sept 30. It has since become E&O's second largest shareholder. At the AGM, ECM nominated two people to E&O's board Mahadzir Azizan and Leong Kam Weng, both lawyers by training but this was shot down by shareholders present at the meeting. To this day, no one quite knows what ECM has in mind for its investment in E&O since it has kept mum on its plans. After the SC's announcement this week, StarBiz tried to contact ECM for its response but was told its management preferred not to comment. Many theories have surfaced about ECM's game plan, with one suggesting that it planned to force Sime Darby's hand in making a MGO. Speculation at the time had it that ECM possessed the support of friendly shareholders within E&O, which would have given it the leverage to swing the vote in its favour during the AGM. The AGM itself was a heated affair. Combined, both the AGM and EGM dragged on for six hours, delaying the afternoon press conference. Minority shareholders took the opportunity to grill Tham on why he did not insist on an MGO by Sime Darby. At the press conference later, E&O deputy managing director Eric Chan revealed that 75% had voted against the election of Mahadzir and Leong, but he also steered the conversation towards E&O's upcoming projects, such as its joint venture with Khazanah Nasional Bhd and Temasek Holdings Pte Ltd to develop a township in Iskandar Malaysia. Now, as this particular chapter is laid to rest, one wonders what ramifications it might have for Corporate Malaysia. Does it, perhaps, set a precedent for similar deals in the future? All said and done, a key takeaway could simply be the classic saying: Let the buyer beware.